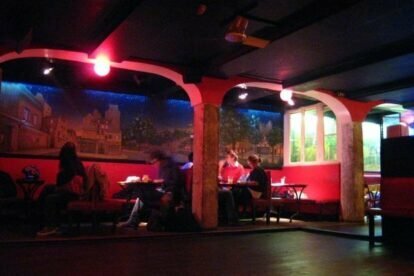 Tucked away at the back of an attractive, but now little-used 1920s art deco shopping arcade is La Java, the oldest nightclub in Paris. Follow the iron staircase underground for a trip back to a Paris of another era! Opened in 1923, La Java was named after a particular dance style that was popular in the city at the time. In this inter-war period it saw the career debuts of several people who would go on to be worldwide stars including Edith Piaf, Maurice Chevalier and Django Reinhardt. Today the venue has been renovated but has kept much of its historical charm. For an authentic night-out in Paris its a great unpretentious place to go. Early on in the evening there is generally live music or stand-up comics, then the dance floor is cleared for clubbers who arrive around midnight.